What could be more enjoyable than touring the Hershey Harrisburg Wine Country on a lovely day and visiting its most acclaimed wineries? Premiere #1 Limousine has the perfect combination of familiarity with the local winemaking community impeccable vehicles, and knowledgeable drivers. Let us handle the driving, and you can enjoy a perfect ambiance for wine-tasting. Our wine tour safely chauffeurs scores of oenophiles on tasting treks in a roomy stretch limousine. Coast carefree, as you recline on leather seats, drink, and repeatedly toast one another for no reason. Winemakers open their doors to give visitors an exclusive opportunity to sample wines and learn from winemakers about the characteristics of each wine. The vineyards in and around central PA are alive with the sweet grapes that make the basis for incredible local wines. Our private limo wine tours are your opportunity to sample the many wines that come from the fertile valleys in and around the Susquehanna River Valley. You’ll get to experience all the wonders of wine making, and indulge in the fruits while sampling the best of the best. If you’ve never tried a limo wine tour, it’s time to take advantage of this chance to safely tempt your taste buds. We can visit wineries that are not listed above, but an additional fee may apply. Bachelorette parties just went up a notch! 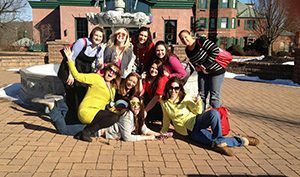 Now you can enjoy a private limo wine tour as part of your bachelorette celebration. Let us pick you up at your Harrisburg-Hershey home location and take you to some of the most celebrated wineries in the area. From Camp Hill and Mechanicsburg to Lancaster and Elizabethtown, we’re the most trusted, convenient way for you and your group of partygoers to make safe memories. What Does a 30-Person Party Bus Look Like? If you’ve never been on a 30-person party bus from Premiere #1 Limousine before, you’re in for a surprise! We are well-known for being particular about the cleanliness of all our vehicles. Not only do we clean them thoroughly before each wine tasting tour, but we also check and double-check them frequently. This means you’ll never have to worry about the way they look. Our 30-person party bus includes the most comfortable seating, affording you true luxury at a cost-effective price. All you have to do is sit back and relax with the friends and family in your group. Our dependable, trained chauffeur will take you wherever you’ve decided to go for your private itinerary. It’s truly a wonderful way to hang out with friends and family without the worries associated with operating a private vehicle while wine tasting. #1: How much advance notice do I need to give to schedule a 30-person party bus? We recommend that you call us at (717) 616-8995 as soon as you know you want to rent one of our 30-person party buses. There are times of the year that are busier than others, and the more time you give us, the more likely we are to accommodate you. #2: Can I buy wines during the wine tour? Absolutely! There is plenty of room in our party bus to store your wines. If you find a wine that you fall in love with, feel free to buy a case! #3: Does every member of our party have to try the wines? No, although the fees for this package do include the wine tasting price for each member of your group. However, most people who don’t actually sample the wines still find the experience to be fun and informational, even if they aren’t wine enthusiasts! Need a Hotel? Ask about our overnight hotel rates.